The city of Sanremo, which was founded in Roman times in a large inlet on the western Ligurian coast, is known as “The Pearl of the Riviera of the flowers” and is famous throughout the world for its perfect climatic conditions for swimming. The climate is mild all year round, due to a privileged geographic location, protected from the north winds ensuring a lowering of the rainfall quotient. Added to this, this stretch of coastline experiences temperatures which allow the growing of tropical plants in the luxuriant botanical gardens which extend the length of the “Riviera of the Flowers”. 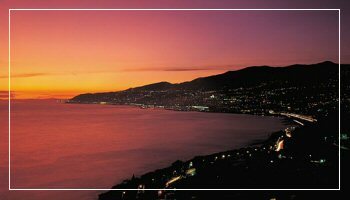 Another factor which has favoured the blossoming of Sanremo has been the development of international tourism which, from its roots in the 19th century, has seen the city and surrounding areas transformed. In fact famous people such as the Tsarina Maria Alexandrovna and the scientist Alfred Nobel actually chose to live here. However, the name of Sanremo has become famous all over the world not only for tourism but also for its association with the production of flowers. The flowers which are cultivated on the hill of Sanremo are then exported all over the world. In addition to the perfume of nature and the beauty of the city there is also a touch of glitz offered all year round in the gaming rooms of the celebratedCasinò and also by the annual event of international repute, the festival of Italian song.